A lot of elk hunters will add liquid smoke seasoning into their elk jerky. At smokegrillbbq.com, we don't always do things the easy way if it is going to sacrifice taste. This smoked elk jerky recipe calls for both a smoker and a dehydrator in order to start the meat off with an authentic smoke flavor and finish it off on a food dehydrator. Smoking the elk for 3 hours while keeping a low temperature of 160 degrees will impart the smoky flavor you want without overcooking and drying it out too fast. You can also swap out our recommended ingredients below with a package of jerky seasoning you can buy at most smoke, grill and BBQ stores. Start by mixing all of your seasoning ingredients and elk hamburger in a large bowl and let them sit in the refrigerator for up to 12 hours, the longer the ingredients marinade the more they will penetrate the meat and enhance the flavor. We recommend preparing this the night before you want to make your jerky. If your grill grate is removable in your smoker, pull it out so you can line the grate with the jerky outside the smoker. Putting your jerky strips on the grate in the kitchen is much easier than directly on a hot grill grate. 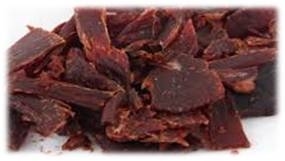 Take your elk meat out of the refrigerator and start to create jerky strips. There are numerous methods for making your deer meat into strips but the easiest method is to purchase an elk jerky gun that will create the strips for you. You can also use a rolling pin and cut the strips manually yourself. Next, add smoker wood chips to your smoker. Rub some olive oil over the smoker grate and lay out all the strips evenly on a single row. If your smoker's grill grates are too far apart and the meat is falling through, don't be afraid to line the grate with foil and put the meat on the foil instead. Just make sure the foil is coated with baking grease and that you do not stack the strips on top of one another. Warm your dehydrator up about half way through the 3 hour smoking process. Pull your elk jerky meat off the smoker at 3 hours and bring it into the kitchen. Line your dehydrator with the elk jerky meat and keep it in the dehydrator for another 5-6 hours. Again, make sure not to stack the jerky on top of one another if possible. Make sure you check your elk jerky before pulling it off. To check it for doneness, let a piece cool, then bend it in half. It should be pliable in the center but the edges should break off.